David Bomberg is perhaps most famous for his paintings influenced by cubism and futurism, such as the Vision of Ezekiel (1912) and The Mud Bath (1914). A key figure on the British art scene before the First World War, Bomberg was associated with a group of artists and writers now known as the Whitechapel Boys, a collection of Anglo-Jewish modernist artists and writers. On his return to England from the Western Front, traumatised by his experience of war, Bomberg went into crisis. He lost his passion for the modern world — abstract painting and the hopes of futurism became connected to the horrors of mechanised warfare. After a period of considerable struggle, he was given a commission by a British Zionist group, the Palestine Foundation Fund, who worked to relocate Jewish settlers in Palestine with the support of the British government following the Balfour Declaration in 1917. Under encouragement from his contemporary Muirhead Bone, the group sponsored Bomberg's travel to Jerusalem, with the expectation that he would produce a number of paintings that would serve as propaganda for their project. Although Bomberg was not a Zionist, he felt rootless and distracted living in England and the attraction of the Holy Land was strong. In 1923 he and his wife Alice arrived in Jerusalem and Bomberg set to work. The paintings he created during this period were not, however, well received by his patrons. Rather than focus on the attractions of new settlements, Bomberg’s work eschewed all reference to modernisation of the land, ignoring the promises of pioneer life so central to the PFF’s cause. Instead Bomberg favoured desolate landscapes that spoke to the long, unchanging spiritual significance of the Holy Land rather than the modern twentieth century city. 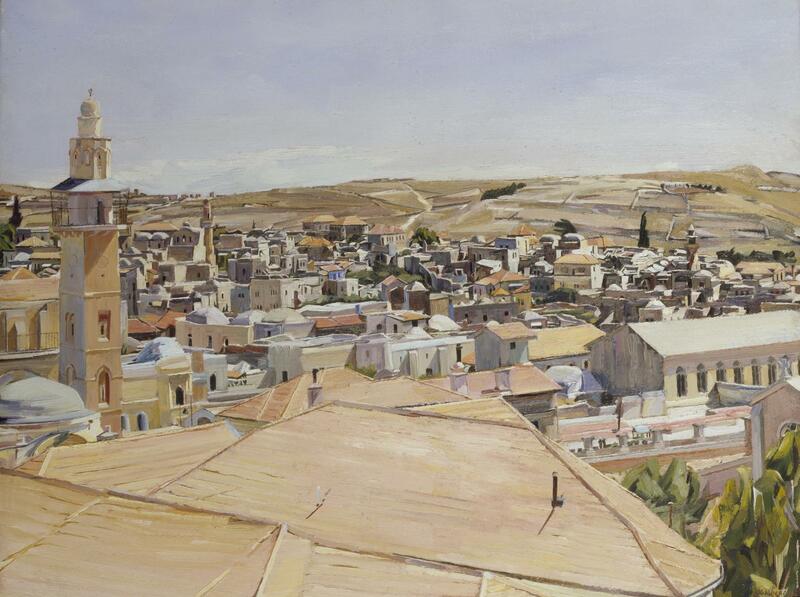 The painting here is typical in presenting a serene, calm, and unpopulated view over the Jerusalem cityscape. Although its figurative style is a far cry from Bomberg's earlier work, there remains some trace of his cubist mode of working in the angular, flat planes of the city’s architecture. Image credit: 'Jerusalem, Looking to Mount Scopus', 1925, David Bomberg (1890-1957).